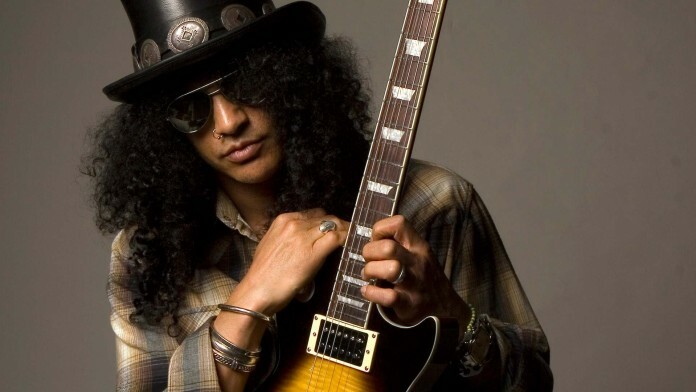 Saul Hudson (born July 23, 1965), better known by his stage name Slash, is an English-American musician and songwriter. He is best known as the lead guitarist of the American hard rock band Guns N' Roses, with whom he achieved worldwide success in the late 1980s and early 1990s. During his later years with Guns N' Roses, Slash formed the side project Slash's Snakepit. After leaving Guns N' Roses in 1996, he co-founded the supergroup Velvet Revolver, which re-established him as a mainstream performer in the mid to late 2000s. Slash has released three solo albums: Slash (2010), featuring an array of guest musicians, and Apocalyptic Love (2012) and World on Fire (2014), recorded with his band, Myles Kennedy and the Conspirators. He returned to Guns N' Roses in 2016. Slash has received critical acclaim and is considered one of the greatest rock guitarists. Time magazine named him runner-up on their list of "The 10 Best Electric Guitar Players" in 2009,while Rolling Stone placed him at number 65 on their list of "The 100 Greatest Guitarists of All Time" in 2011.Guitar World ranked his guitar solo in "November Rain" number 6 on their list of "The 100 Greatest Guitar Solos" in 2008,and Total Guitar placed his riff in "Sweet Child o' Mine" at number 1 on their list of "The 100 Greatest Riffs" in 2004.In 2010, Gibson Guitar Corporation ranked Slash as number 34 on their "Top 50 Guitarists of All Time", while their readers landed him number 9 on Gibson's "Top 25 Guitarists of All Time".In 2012, he was inducted into the Rock and Roll Hall of Fame as a member of Guns N' Roses' classic line-up. Saul Hudson was born in Hampstead, London.He was named for Saul Steinberg, an artist.His mother, Ola J. Hudson (née Oliver;1946–2009),was an African-American costume designer, whose clients included David Bowie, and his father, Anthony Hudson, is an English artist who created album covers for musicians such as Neil Young and Joni Mitchell., Of his mixed background, Slash later remarked, "As a musician, I've always been amused that I'm both British and black; particularly because so many American musicians seem to aspire to be British while so many British musicians, in the 'Sixties in particular, went to such great pains to be black." During his early years, Slash was raised by his father and paternal grandparents in Stoke-on-Trent, Staffordshire, while his mother moved to Los Angeles for work.When Slash was around five years old, he and his father joined his mother in Los Angeles, California.His brother, Albion "Ash" Hudson, was born in 1972.Following his parents' separation in 1974,Slash became a self-described "problem child. "He chose to live with his mother and was often sent to live with his beloved maternal grandmother whenever his mother had to travel for her job.Slash sometimes accompanied his mother to work, where he met several film and music stars.He was given the nickname "Slash" by actor Seymour Cassel, because he was "always in a hurry, zipping around from one thing to another." In 1979, Slash decided to form a band with his friend Steven Adler.The band never materialized, but it prompted Slash to take up an instrument. Since Adler had designated himself the role of guitarist, Slash decided to learn how to play bass.Equipped with a one-string flamenco guitar given to him by his grandmother, he began taking classes with Robert Wolin, a teacher at Fairfax Music School.During his first lesson, Slash decided to switch from bass to guitar after hearing Wolin play "Brown Sugar" by The Rolling Stones.His decision to play guitar was further influenced by one of his school teachers, who would play songs by Cream and Led Zeppelin for his students. As a result, Slash stated, "When I heard him do that, I said, 'That's what I want to do. "A champion BMX rider,Slash put the bike aside to devote himself to playing guitar,practicing up to 12 hours a day.